Bathroom is one of the most visited places in the house, after all come here at least twice a day: in the morning, to cheer up the working day and night to wash away tiredness and relax before bedtime. Therefore, it is important that the bathroom was not only comfortable, but also functional. 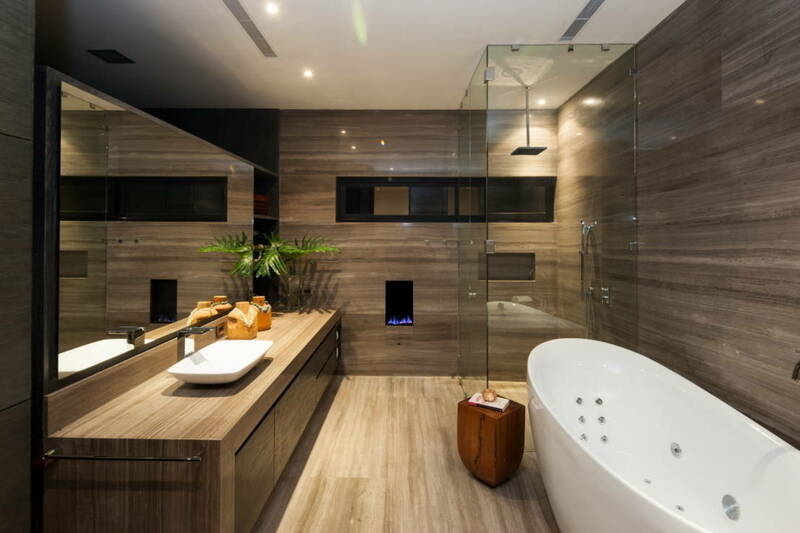 Bathroom interior should be as comfortable and reflect your attitude. Better in the interior design of the bathroom to make several light sources: bright (the case when you paint, combs, shaving, etc.) and muted (when you are relaxing after a hard day). 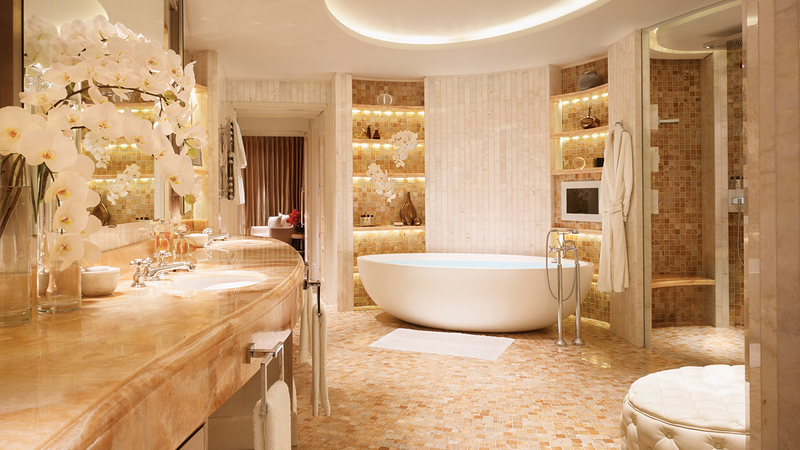 Our experts will help you create bathroom design according to your habits, claims and taste. The bathroom is a very important space in the house. In it, we get a charge of morning cheerfulness and good mood, in it we prepare for bed after a busy day. That is why the design of the bathroom should be chosen harmoniously and respond to several purposes at once: to have a relaxing atmosphere, to be stylish, comfortable and able to cheer up. Taking a bath or shower, everyone can observe how much steam and condensate is formed in the air. This means that absolutely all materials for finishing a small bathroom should be waterproof and resistant to temperature changes. Consider, some, important points in creating a bathroom design. 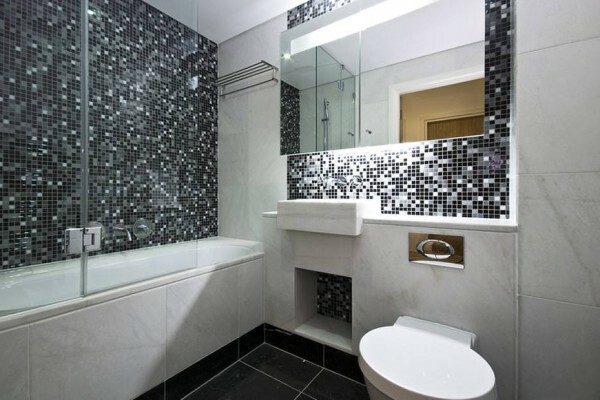 First and foremost, you need to decide what style your bathroom will be designed for, then you should think over the layout of the room, and the last, but the most important, is the choice of building materials and sanitary equipment for the bathroom. And further - the market opportunities and the flight of imagination provide unlimited freedom of choice in the design of the bathroom. When setting up a bathroom, try to decide what you would like to get as a result. 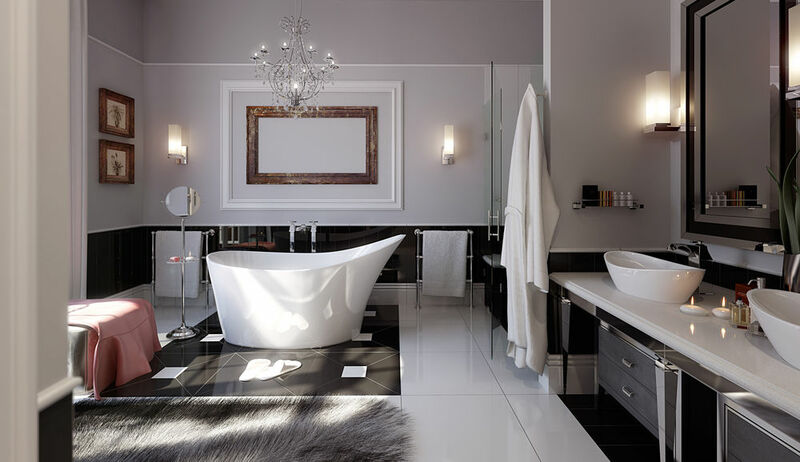 But most importantly, you need to remember that the design of the bathroom should give you pleasure, and the artistic style of decoration can be anything: from the restrained classic to the pretentious modern. 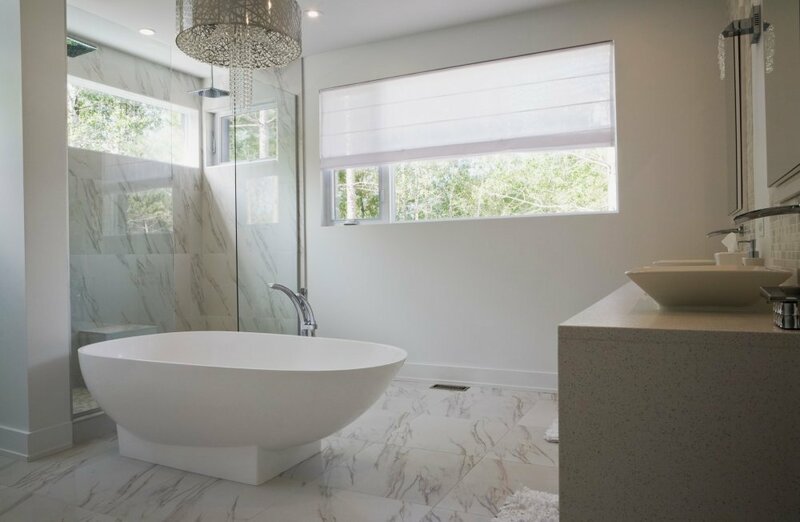 You can create a bathroom design that is consonant with the overall style of the rest of the rooms, or by allowing the imagination to create an absolutely opposite interior. 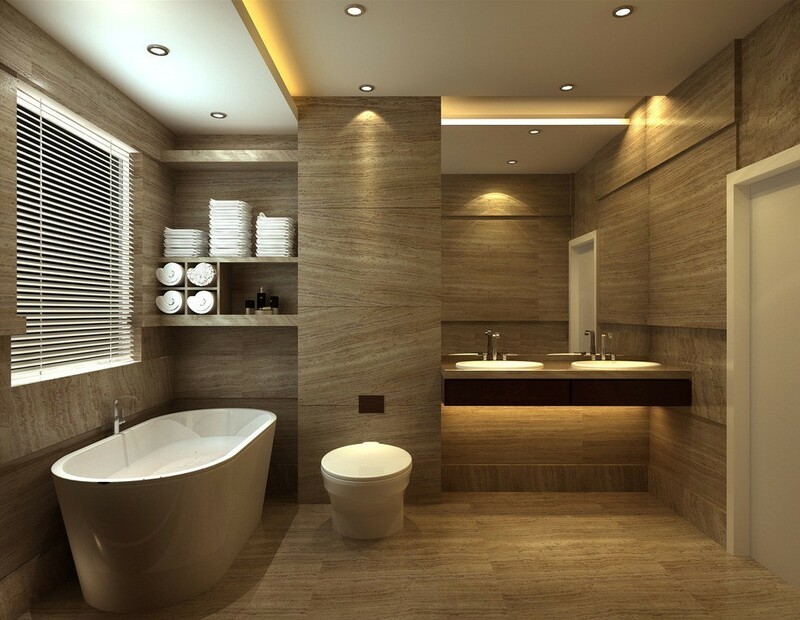 What are the features you give your bathroom: pomposity or calm respectability, pretentiousness or asceticism, restraint of colors or their violence, depends only on the wealth of your design fantasy. A wide variety of finishing materials - ceramic tiles, marble, wood, burnt clay, ceramic granite, mosaic and much more - and a huge selection of sanitary ware and accessories give wide design possibilities and allow to create really luxurious and comfortable bathrooms. The main requirements for the finishing materials used in the bathroom are hygienic, easy to clean, and waterproof and acid-alkali resistant. Therefore, one of the traditional and familiar materials for finishing the bathroom is ceramic tiles, which has all of the above qualities. The market of building and finishing materials offers ceramic tiles and mosaics of various qualities, shades, textures and price category. Improperly selected finishing materials can spoil the impression even from the best sanitary equipment and stylish bathroom furniture. 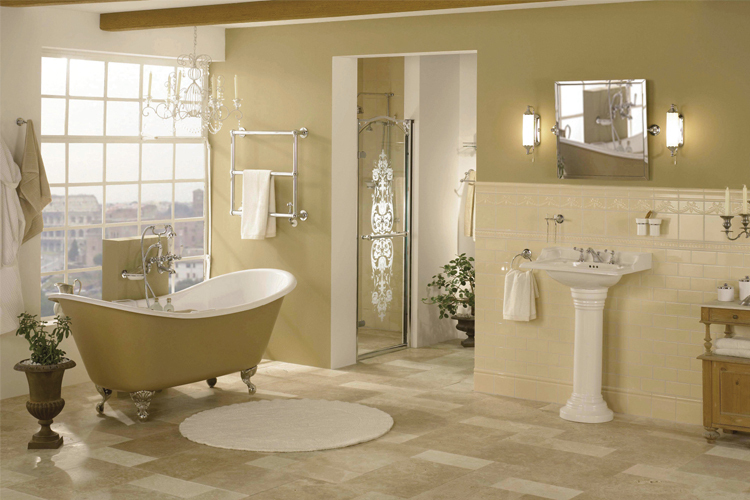 The decor of walls, ceiling and floor sets the tone for the entire decoration of the bathroom. 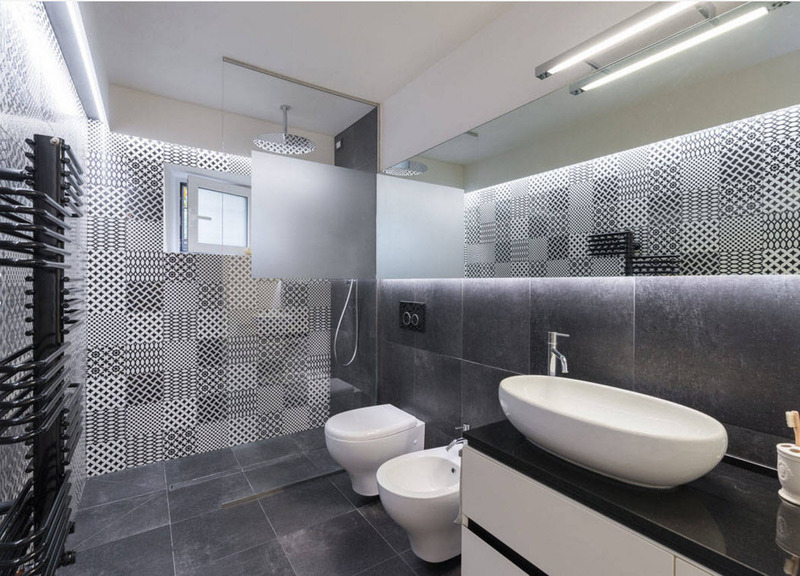 Therefore, when planning the design of the bathroom, you should carefully choose the color scheme, since it is designed to create mood and visual reduction or increase the space of the room. A combination of warm and cold tones is preferred. Correctly chosen decorative solution will create an atmosphere of exceptional comfort in your bathroom. Modern collections of furniture for the bathroom provide a wide choice and give the opportunity to create a cozy and charming in both a small and a large bathroom. Models of furniture placed in the bathroom should be functionally saturated, have storage facilities for objects of various sizes, and be resistant to corrosive media and moisture. Furniture for the bathroom is produced both in the classical version, and in the style of art deco, modern, from which you can always create something unrepeatable. The artistic decision of furniture for bathrooms assumes the presence of glass or mirror doors in lockers finished with metal, wood or colored plastic. The selection of sanitary products is the most important and indispensable attribute of the bathroom. First of all, with the arrangement, it is necessary to make a choice between a bathroom and a shower. In this matter, you should take into account personal preferences, size and design of the room, the cost of the product. Also of great importance for design and comfort are toilets, sinks and mixers. In general, all the plumbing in the bathroom should be as compact and pleasant as possible in terms of aesthetic beauty and functionality. 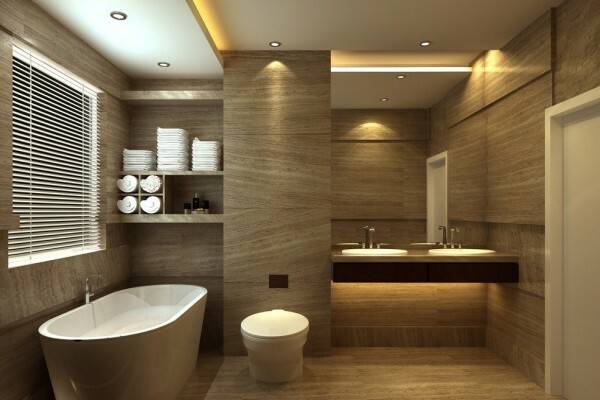 Another aspect in the design of the bathroom is lighting. 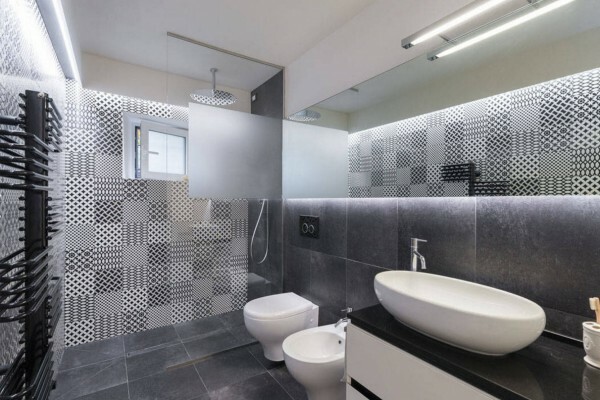 Unlike other premises of the apartment in the bathroom you need a bright light that would be able to see yourself well. Fixtures should be safe, protected from direct moisture and match the design of sanitary accessories, fit into the interior. You can emphasize the color solution by highlighting individual elements: shelves, tile patterns, niches. One of the optimal solutions can be considered the possibility of combining several luminaires built in the suspended ceiling and the necessary number of lighting devices as a local illumination of individual zones - a mirror, a washbasin, a shower, a bathroom or a washing machine. Here everything depends on your financial capabilities and bathroom dimensions. "Mabeli" is pleased to give you the opportunity to see the future interior of the bathroom in all its beauty in 3D format. The specialists of the company, based on your wishes and functional features of the premises, will create your virtual interior. WANT TO KNOW THE COST OF REPAIRS? Contact us and our specialist will come and make an estimate!